Ellen Elder wanted to share with everyone that her new art center... ArtExposure... will have it's Grand Opening on May 2nd from 10AM to 5PM (with Arts and Crafts, Wine-Tasting and more). Plein Air FUN at Cedar Point! Welcome to three new members! This shot of Stephen painting sums up the beauty of the day and the location for our April "Paint Out"! If you missed this one you missed a real treat... the weather and scenery were splendid! OOPS members present.. LtoR... Bernie, Olivia, Susan, Mitchell, Patsy, Stephen, Kit (holding Katie), Patrick, Pat, Dean, Tony, and Kathy. Susan Cheatham drove in from Arapahoe to join us. She picked out a great spot to paint from. Patrick, our new member from Hampstead, managed to get two paintings finished before the days end. New member, Kathy, sketches while her husband, Tony (below), paints from a good vantage point. Dean managed to paint two great paintings! Patsy found a good place to work from. Thanks for the snacks Patsy! Mitchell painting a cool marsh scene. Check out the new OOPS blog banner at the top... who is that guy? Dean snapped this shot of Bernie in a secluded spot. Olivia had fun painting and playing with Katie (Kit's dog)... I'm sure Katie slept good Sunday night! Kit had a good time and finished a GREAT painting! Dean setting up the camera for a group shot... or is he just relaxing after painting two paintings? We sure had a great time. Afterwards many of us gathered at T&W Oyster Bar for good food, good fellowship, and educating critiques. Karen missed painting with us last Sunday because she was working on her new website... that got me to thinking... check out Karen's new website, our newest member Patrick's website, and several other members who have sites. A list with links can be found in the side bar of this OOPS blog. 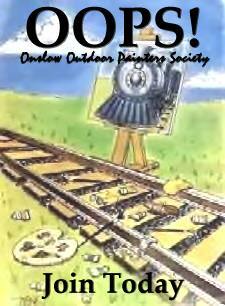 Call to All Plein Air Painters... 2nd Annual Kinston Paint Out! The Community Council for the Arts is hosting it's second annual Plein Air Paint Out and Juried Exhibition April 30- May 9, 2009. This paint out coincides with the Kinston/ Lenoir Chamber of Commerce's signature event, The BBQ Festival on the Neuse. Plein Air Painters of all skill level are invited to paint our historic downtown and charming waterfront on April 30 & May 1st from 9- 5 PM. An entry fee of $15 will allow you to enter the competition and compete for the 1st, 2nd or 3rd place prizes. Our first place winner will be featured on the 2010 Festival On the Neuse posters! At the close of the day on Friday, participants are invited to bring their best three pieces to the Arts Center to be on display for the week. The sale of all art work is strongly encouraged. Download the Plein Air Application form here (PDF). PS... you may want to check out Larry's plein air demos... there is a link to them in our Tips, Techniques, Demos, Videos, and Info for Plein Air Artists side bar. Plein Air is putting all your experience and knowledge aside, your reputation and prepare for chapter and verse of learning to see and paint all over again. Nature is a great teacher, but throws a lot of lumber at you. The upside is...you may very well arrive at an epiphany moment (all prior painting experience and reputation aside), and suddenly see that you are becoming a painter. There is something pure and honest about the moment outdoors, seeing something that excites your aesthetic senses, then introspectively being suspicious that given the opportunity YOU'LL mess it up and blow the whole thing. The novice sees everything and attempts to paint it all. Setting up perhaps with some initial notion...but an elusive one. An undisciplined impracticality that requires to be honed, shorn up... or top the moment and not chasing it. The mature painter sets up recognizing the compulsion to paint. Experience leads to understand that few essentials are responsible to nail down and capture that which was responsible for demanding to be painted. The mature painter discriminates...recognizing that noting what ought NOT to be painted is as important if not MORE than what is painted. The mature painter having worked thru hundreds of paintings understands that nature throws a lot of lumber...that is, many more visual voices that become recognized to exist only after starting the painting, for painting is a means to opens the eye to see more. It is the more seen, that becomes dangerous for the novice, thinking him/herself astute in seeing to put it down as validation of some higher greater proof of their powers of observation. They will learn in time that paintings work for reasons paintings work. A good thing to say to yourself again and again nearly as a mantra for your painting time is "where everything is shouting, nothing gets heard"
Over my years painting and teaching workshops... beginning painters are very conscientious about integrity of what they are seeing. There is this underlying sense that you are beginning to get on top of painting outdoors when your painting more accurately represents what you are seeing and the colors you are seeing. However... such is no guarantee that nature has cooperated to deliver you a fine compositional layout. As an artist that matures painting outdoors, you will learn that nature is yet a reference, and that again paintings work for reasons paintings work. In time...you will nearly learn to see your painting finished before you begin it...seeing in your mind those few essentials extrapolated in a masterful way to assure a sound solid painting the result. Perhaps it will require to make one group of trees taller to take on that necessary role of a vertical juxtaposition against an otherwise bland horizontal mass. Perhaps it will be to extend the end of a mass beyond the central divide of your canvas so that the cliche of symmetry is avoided. It takes time to understand a number of things, primarily that which is responsible for tripping your trigger...grabbing you by the jugular and demanding to be painted. Painting from life, the moment, responding to the light is perhaps more about coming to know yourself more intimately and coming to peaceful terms about your aesthetic whims and heart. The harmony sought thus is not one just on the canvas alone between working parts, pigments, and elements...but one that is in sync with your own artistic heart. It is indeed about painting the effects of light...and painting outdoors you will become near insanely attuned to your surroundings. Driving down the road very little will escape you, and you begin to feel more fully alive. You will learn to adjust your painting routine knowing your area and that important aspect of light which is threatening at any moment to vacate, leaving you standing there wondering whatever it was that drew your interest to begin with. You may change your supports ground, a midgray perhaps or toned so that the very few touches of paint instantly record what light is doing. White canvas so often fights against such immediacy, requiring much of the canvas to be filled in first before a sense of what is happening is finally seen in cohort of everything else. By that time the light may have changed several times...and the result is you have several paintings going on at once. So...my suggestions are that you do not set out to begin this journey with allusions of coming home with successful works. In the beginning, it will be about conditioning yourself. Developing a working palette...a routine of expediency, and empowering your sense of vision that underscores the "why?" of your need to set up and paint. I often say it takes about 120 bad paintings to learn something about painting, and again and again I have had my share of amusement and laughs when a seasoned well known and popular artist very experienced in their genre/field tries plein air for the first time and admits to feeling as though they knew nothing of painting whatsoever! No need to paint large when you first begin. I suggest bringing a dozen 5"x 7"s... and in the beginning use just black and white and do value studies. A dark, mid, light and white. Squint the eyes... see the main masses, and put them down. Then note those areas of the main masses that melt and lead the eye into the next as a bridge. This is where the halftones are painted. In time...mix up your dominant colors the same way. If the scene is predominantly green...pre-mix up a dark green, mid green, light green...before starting to paint. See the distant masses represented simply...perhaps cools, and relegate to one or two values. There are many more palette strategies to go from here, but this very simple approach will get you started and cause you to feel you are getting some handle on this. My Bargain Bin blog- "Will Paint For Gas!" Art Imitates Life... and Vice Versa... An Impressionistic "En Plein Aire" Demonstration by Bernie Rosage Jr. It has often been said that "art imitates life and life imitates art"... and there is valid truth to that statement. Life is a progression, a maturing movement, and is often... not what it seems. Ones art talent naturally is a progression (at least hopefully) that matures with time, practice, and experience. Artwork, in many cases, through technique takes on a progression through stages and matures to completion. What about those in between stages where things aren't as they seem?... a stage that can actually be UGLY! Just like in life... patience, perserverance, and hard work produce masterpieces that we never dreamed of. This next painting is a great visual example of the statements listed above. Another one done "en plein aire" on location in the mountains of North Carolina. Once again, Tami dropped me off, this time in a field where I had been observing these haystacks all week. In the Blue Ridge Mountains near Boone, NC, the open fields are covered with these haystacks (haybales is probably a better name) in the early summer... a beautiful site. I wanted to try and paint them similar to Monet's impressionistic style since we both seemed to have a thing for haystacks. I blocked in areas with the complimentary color as an under-painting per say to the colors I planned on using. Nothing fancy... used a brush and a palette knife. You could call this the UGLY stage. Refined and refined some more... and at last finished in about 2 1/2 hours time. "Haystacks near Todd, NC", 12"x9" Oil on Canvas Board, "en plein air", 2005. OK... looks a little more Van Gogh-ish than Monet-ish.... but.... what the hay! A couple of messages from Susan Cheatham... our artist friend from Oriental. Friday the Oriental Painters are heading into the Tryon Palace Gardens at 9am. See if you can get off work and meet us for painting garden colors... pass on the info to the OPPS Gang... the gardens are open all weekend for free. More info for your group. Do any of your guys want to come to Art on the Neuse and do a booth together? Love to have you all and spend a day showing art. We are cheap. Its the day before Fathers Day (June 20) and usually a good day for out-of-towners doing the camp visit. WHAT: OOPS April "Paint Out"... Organized by Stephen, Mitchell, Dean, and Bernie. WHERE: Cedar Point location of the Croatan National Forest Park just outside of Onslow County in Carteret County... see map, photos, and details below. WHAT ELSE: Maybe a dutch treat dinner somewhere we all agree upon or possibly a cookout at the park????? Expecting a BIG turn out from OOPS members! Newbies welcome... all mediums and skill levels... simply show up with your gear and be prepared to have fun! What the heck is OOPS and how do I join the FUN? There is a hiking trail that offers a ton of great painting opportunities... just be prepared to carry your gear anywhere from 100 yards to 1/2 mile or more. The following photos show the views from the trail. Cedar Point Tideland Trail, a National Recreation Trail, includes a 0.6-mile loop and a 1.3-mile loop that provide excellent opportunities to view wildlife and explore the salt marsh and adjoining forest. Interpretive signs along the short loop tell the story of the ever changing salt marsh. The trail meanders through pine and hardwood forests damaged by Hurricanes Bertha and Fran in 1996. Boardwalks cross marshes and open water and offer views of wading birds and other wildlife. The town of Swansboro can be seen in the distance in the photo below. Savannah (Bernie's granddaughter) enjoying the hike! Restrooms are available near the parking area. Grills and picnic tables are also available if anyone is interested in cooking out. a fishing pier, canoeing, and kayaking. Sherry Thurston (Artist and owner of Thurston Art Gallery, 328 Peru Road, Sneads Ferry, NC 28460, 910-327-1781) wanted me to pass this info on to all OOPS members. Upcoming art show at Thurston Art Gallery for the public is June 30th to July 31st, Open House July 3rd 6 to 8pm. Artists jpegs, application & 10.00 fee due April 18th. Two pieces, small, up to 18” x 24” (if there is more room we will let you know).. Jewelry 8 pieces, sculpture dependent upon size, weight and display. Visit www.thurstonartgallery.com to get map and see more about the gallery. Email Mike at rooneystudios@hotmail.com to get more info on any of these workshops! Pre-registration is required on ALL workshops! Email me to pre-register. This workshop will be a one day class on how to use the "Cape Cod" underpainting technique that i use to start my paintings. this method came originally from Hawthorne and Hensche, and is now used by many contemporary greats like Peggi-Kroll Roberts, Camille Pryzwodek, Susan Sarback, and Lois Griffel. This technique gives an amazing sense of light to your paintings.There will be lots of painting in this oneThis class is not for beginning painters and you must be an intermediate to advanced oil, acrylic, or pastel painter, or a beginner who has taken one of my workshops before. This Saturday workshop will take the mystery out of color. i'll describe how to mix any color both from a limited palette and from split primary palette etc. i'll show you how to gray a color but still keep it from turning to mud and how to lighten and darken a color to keep it colorful without adding its complement.you'll know all the ins and outs of color mixing after this one. In this workshop we'll be learning how to capture the "feel" of the outdoor scene by learning how-to's on composition, color and value. Guaranteed to take the mystery out of painting 'en plein air' ! In this weekend workshop we'll be learning how to capture the "feel" of the outdoor scene by learning how-to's on composition, color and value. Guaranteed to take the mystery out of painting 'en plein air' ! Plein Air Painting- Loose and ColorfulIn this weekend workshop we'll be learning how to capture the "feel" of the outdoor scene by learning how-to's on composition, color and value. Guaranteed to take the mystery out of painting 'en plein air' ! This workshop is designed for the participant who wants to learn about painting the landscape directly from nature in pastel and/or oil. The majority of the class will be held on location. In addition there will be classroom discussion and demonstrations relating to landscape painting in general, and pastel or oil in particular. Included in the demos will be one aimed at improving photography as a reference. In case of bad weather, painting will be in the studio from photos or your field studies, so bring some landscape photos or field studies with you (just in case). Jerry's Artarama Painting Contests ~ Over $15,000 in prizes! Check out these painting contests sponsored by Jerry's Artarama... over $15,000 in prizes... WOW!